"In geology we cannot dispense with conjectures: [but] because we are condemned to dream let us ensure that our dreams are like those of sane men-e.g. that they have their foundations in truth-and are not like the dreams of the sick, formed by strange combinations of phantasms, contrary to nature and therefore incredible." 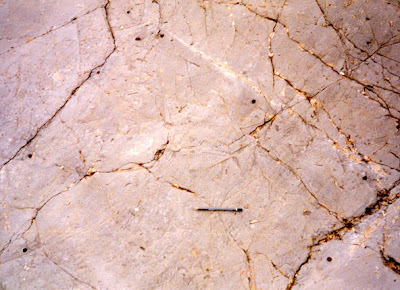 The fine-grained, greyish to yellow, cherty limestone surrounding the area of the small village of Pietraroia (or Pietraroja in the Italian province of Benevento/Campania) was in the past a popular rock used widely in construction works, but for centuries it provided also more peculiar treasures - exceptional well conserved fossils forming an important fossil-Lagerstätte of the Cretaceous. "There [in the Matese Massif] inside the valleys, eroded by the streams of rainwater, you will discover rocks with the imprints of many kinds of fish, especially sardines." "Sopra Cerreto sorge l'alta montagna di Pietra Roja che è una delle cornate del Matese, molto interessante per i prodotti che presenta. Questa montagna in alcune parti è composta da pietra calcarea scissile con impressioni di pesci. La durezza però dello schisto e la molteplicità delle venature spatole che s'intersecano in molte direzioni, fan sì, che con difficoltà se ne possano avere de' belli esemplari, né sono giammai di quella precisione e bellezza che si osserva ne' pesci fossili di Bolca". "Above Cerreto rises upwards the mountain of Pietra Roja....very interesting for some features it presents. This mountain in some parts is composed of cleaved limestone with the impressions of fishes. However the hardness of this shale and the multiplicity of the crystalline fissures, which intersects in many directions, make it hard to recover some good specimen, they are never as well preserved and beautiful as the fossil fishes of Bolca." In the years 1853 to 1864 the geologist Oronzo Gabriele Costa (1789-1867) published various volumes of his "Paleontologia del Regno di Napoli", where he in magnificent prints depicted the fossil fishes of the "fishes-bearing limestone of Pietraroia", name that was later also adopted to designate the geologic formation of Pietraroia. Fig.2. 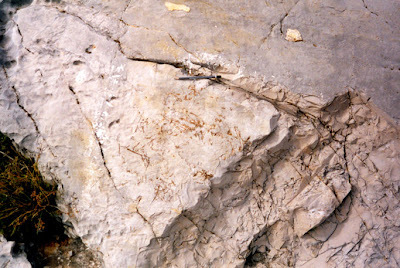 Impression of articulated fossil fish as found in the limestone-Lagerstätte of Pietraroia, the tail can be seen above the pencil. Fig.3. Disarticluated skeleton in typical reddish-brown preservation. The formation of Pietraroia, also Pietraroia Plattenkalk, consists of a succession of thick bedded limestone and dolostone, with embedded greenish layers of marl and rare fossils in the lower part, and 2-25cm thick bedded bituminous limestone and dolostone whit chert-layers and a rich variety of vertebrate fossils in the upper part. Fig.4. Former quarry with outcrops of the vertebrates rich Plattenkalke (upper part of the Pietraroia-formation), today included (in theory) in the protected Geo-Park of Pietraroia. The fossils are found on the limestone surface in the foreground, the former bottom of an ancient sea basin. The macrofossils found in this formation comprise ammonites, crustaceans, a rich variety of fishes, crocodiles, three species of (presumed) lizards, one species of amphibian and one species of larger vertebrate. 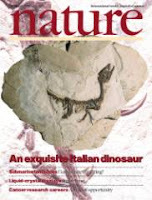 In fact the Plattenkalk of Pietraroia became worldwide known to the paleontological community in 1998, when a nearly complete skeleton of a dinosaur was described by the Italian palaeontologists Cristiano Dal Sasso and Marco Signore in an article in the prestigious journal "Nature" and the new species named Scipionyx samniticus. The described fossil was extraordinary; a nearly complete and articulated skeleton of a small (23cm long) bipedal dinosaur, lacking only parts of the tail and some bones of the hind legs, additionally in the body cavity there were structures interpretated as imprints of the inner organs; it was in fact so photogenic that Scipionyx samniticus, or Ciro as the fossil was nicknamed by an Italian newspaper that financed the research of the fossil, made it on the cover of the actual edition of Nature. At the time it was one of the best preserved theropods known to science. The genus "claw of Scipio" is dedicated to Scipione Breislak, who first described the locality, the species name derives from the ancient Latin name for the region of South Italy of Samnium, which comprised modern Campania. - One version of the story of the recovery of Scipionyx claims that it was found in 1979 by an anonymous boy who handled the fossil over to an amateur palaeontologist, who did not recognize it as dinosaur and only in 1993 contacted the museum of natural history museum of Milan to determinate the species. - Another version claims that the fossil was discovered by accident by two tourists of Milan visiting the village of Pietraroia. They took the fossil with them, but only in 1993 and after the release of the movie "Jurassic Park" they recognized it as possible dinosaur and handled it over to the authorities of the natural history museum of Milan. 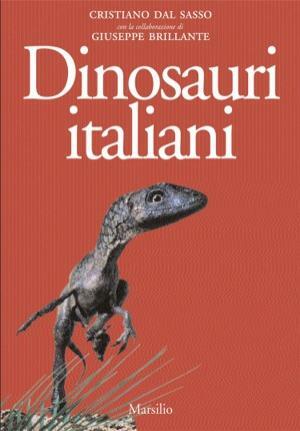 - A third versions claims that an anonymous palaeontologist obtained the fossil from a collector with contacts to the black market, and finally handled it over to the museum in Milan. - The official version, published in most reports and books, attributes the discovery to the amateur fossil collector Giovanni Todesco from Verona. Todesco during a journey in South Italy visited the site of Pietraroia and hoping to collect some fossils he examined a slab of unusual shape in a dump of rocks used for the construction of a new street. Observing more carefully the rock he noted imprints of bones covered by a thin layer of sediments. He took the slab home and tried to remove the thin layer of sediments, but soon abandoned this arduous task and the presumed bird-fossil became forgotten for years. Only in 1992 Todesco contacted the palaeontologist Giorgio Teruzzi, who finally recognized it as dinosaur and contacted the rare Italian dino-experts. Scipionyx and the Lagerstätte of Pietraroia is not only an important paleontological discovery, but was useful also for geologist. The taphonomy of Scipionyx and the other discovered vertebrates helps to reconstruct the environment in which they lived and has important implications of the paleogeography of the Italian peninsula and the Tethys Ocean. The limestone consists mostly of fragments of foraminifers and spicule of echinoderms, reworked algae and clastic deposits. Such sediments were produced in a biologically active zone were enough sun light and nourishment are available. However the distinct stratification and the presence of bitumen in the Plattenkalke points to an environment without currents, which could disturb the deposition of sediments, and the lack of oxygen, inhibiting the biologically breakdown of organic matter. Also the presence of terrestrial vertebrates on the surface of the layers shows that these are single sedimentation-events, probably the sediments engulfed very fast the remains of dead animals and conserved them fully articulated. The presence of larger animals like reptiles and amphibians in the fossil record, depending on the availability of freshwater, proves the former presence of islands or large areas of land covered with vegetation and with large rivers - interestingly in the geologic record there are no such direct hinds and until some decades ago the Tethys Ocean was therefore reconstructed as a large, monotonous and shallow sea. The modern reconstruction of the environment of Scipionyx includes an archipelago of islands scattered in the Cretaceous Tethys Ocean, large enough to sustain populations of endemic dinosaur species and surrounded by lagoons with a high biologic productivity. Submarine channels connected the deltas of rivers coming from inland of the islands to deeper basins in the sea with reduced oxygen content and low biologic activity. From time to time turbidity currents descended these channels, carrying with them the carcasses of animals drowned in the rivers or in the lagoon and embedding them in fine grained sediments, protecting them from currents, decay and scavengers. 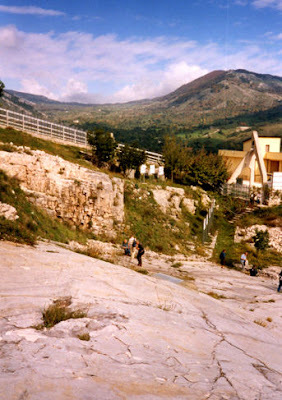 Soon after the publication and description of Scipionyx and the increased interest in the Lagerstätte of Pietraroia it was attempted to protect the area and encourage it as local touristic attraction with the foundation of an Geo-Park, until 2001 also field campaigns to study the geology and recover other fossils were initiated, but finally the money run out and the area was soon vandalized, displays and structures damaged and even entire fossils stolen. Fig.6. 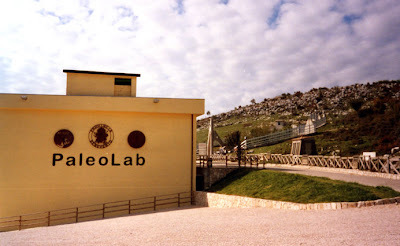 The PaleoLab museum with the protected (but not guarded) park in the background. "however there is still hope and rumours about a monograph dedicated to Scipionyx..."